Oops! The last morsel left for a pic! Found this online as I needed to make some quick for country-style ribs I cooked. Again, used the basic recipe as a guide in what to use, but not necessarily the measurements called for. 1. Combine all ingredients in a medium saucepan. Bring to a boil; cover, reduce heat and simmer for 20 minutes. 2. 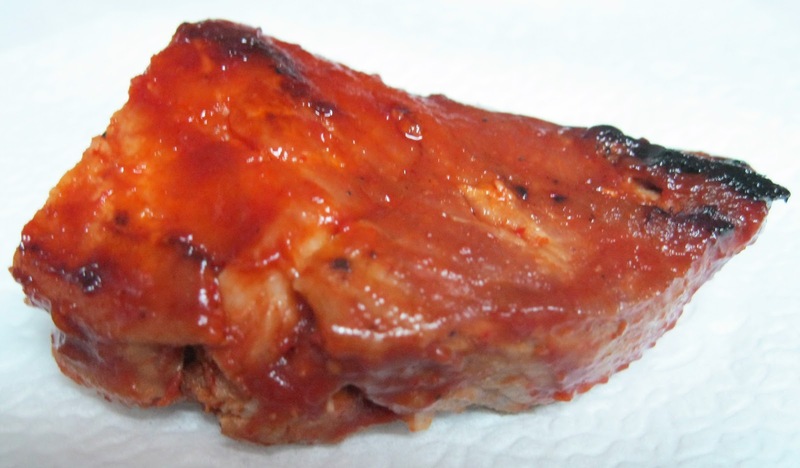 Brush over chicken or pork while grilling or broiling. Well, right off the bat, no tomato sauce - substituted ketchup. And instead of measuring I just poured enough into the saucepan until it looked like an amount sufficient for the ribs. Again, same with the lemon juice - probably ended up using 1/4 cup. Added enough ground red pepper until I thought it tasted spicy enough. Definitely a hit as it has a sweet, tart and spicy flavor!